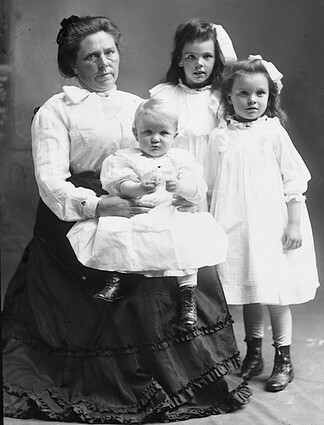 Today I found out about the fascinating tale of Belle Gunness, “The Lady Bluebeard,” who is thought to have murdered her husbands, her children, and a couple dozen more people during her lifetime. You probably remember Bluebeard, the title character in the French folk tale by Charles Perrault, which you might have stumbled across in a fairy tale book or two. Bluebeard was a man who had been married several times, but no one knew what had happened to his previous wives. When he takes on a new wife, she discovers the murdered bodies of the old wives in a small, forbidden room. It’s the kind of thing you hope will stick to the storybook pages, but for Belle Gunness’ victims, that was not the case. Gunness was virtually unknown before she emigrated to the United States from Norway between 1881 and 1886. There is a story that she was beaten by a man while pregnant at the age of seventeen, causing a miscarriage and a distinct personality change. Supposedly the man died shortly thereafter with symptoms akin to those of poisoning, but there’s little documentation to support this. Nevertheless, the incident could have been what spurred her to move to America… or it’s possible that she simply moved to be with her sister, who had emigrated some years before. Whatever the case, Gunness met the (first) man of her dreams in Chicago, where they married in 1893. His name was Mads Ditlev Anton Sorenson, and he didn’t know it yet, but he was going to be Gunness’ first known victim. Together, the seemingly happy couple opened a confectionery store and had four children together—Caroline, Axel, Myrtle, and Lucy. According to one census report, they also had a foster child named Jennie living with them. A year after starting the confectionery store, business wasn’t so hot. That is, until the building caught fire and Gunness and her husband were able to collect insurance for the “accident.” It’s possible that Gunness actually started the fire, or that collecting insurance gave her the idea to collect more insurance from other sources. Over the next few years, two of their children, Caroline and Axel, died officially from acute colitis. However, many of the symptoms of acute colitis, such as abdominal pain, are in line with the symptoms of poisoning. It’s possible that a doctor, unwilling to believe that a mother would poison her own children, didn’t look into the two deaths as well as he should have. Both Caroline and Axel had life insurance, and the insurance company lined Gunness’ pockets after her tragic loss. As for Gunness’ husband Sorenson, he died in 1900—conveniently on the one day that his two life insurance policies overlapped. There are a few different theories about how he died, but officially it was recorded that his heart gave out. The doctor attending him originally thought he was suffering from strychnine poisoning but was later convinced not to look into it; the death wasn’t considered suspicious by most (though Sorenson’s family requested it be investigated, their demands were never met). Gunness was paid $8000 dollars (about $217,000 today) in insurance money. In 1901, Gunness used the money to purchase a farm in La Porte, Indiana. Shortly after the purchase, part of the property burned down and, you guessed it, she collected money for it from the insurance companies. A short while later, Gunness met the (second) love of her life: Peter Gunness. Mr. Gunness was a recent widower with two daughters. The pair married on April 1, 1902, and the three Gunnesses moved in to the farm house with Mrs. Gunness and her two remaining daughters from her previous marriage. Unfortunately, bad things tend to happen to children when Mrs. Gunness is around, and the younger of Mr. Gunness’ two daughters died shortly after the wedding from “unknown causes,” though it is known that she passed while she was in Belle’s sole care. In December 1902, Mr. Gunness himself met a terrible fate when a meat chopper fell on his head, killing him. Foster daughter Jennie arrived on the scene shortly after and saw Mrs. Gunness sobbing over his body. Anyone suspicious yet? Jennie apparently was. She was overheard saying, “”My mama killed my papa. She hit him with a meat cleaver and he died. Don’t tell a soul,” which prompted an investigation into Mr. Gunness’ death. The coroner was at first convinced that he had been murdered, but was later persuaded by Mrs. Gunness that she hadn’t done anything wrong. As she was pregnant at the time, it’s possible that she used her condition to underline how innocent and harmless she was. Gunness later cashed in on $3000 (about $81,000 today) from Mr. Gunness’ insurance policy. She gave birth to a son, Phillip, in May 1903, adding to her brood—Jennie, Lucy, and Myrtle remained in the house. Mr. Gunness’ elder daughter was taken away by a kindly uncle who likely saved her life by getting her out of the house. Many men did answer her ad. They came bearing gifts of cash, such as John Moe who brought $1000 to Gunness to demonstrate his wealth, and disappeared shortly thereafter, never to be heard from again. To the people of La Porte, it simply looked like Gunness had a lot of suitors, and no one was entirely surprised. Even with age and filling out quite a bit, Gunness was considered a beauty with her blonde hair, tall figure, and shining white smile. Yet all of those disappearances couldn’t go unnoticed in her own home. Jennie, who had already proven something of a liability after the death of Gunness’ second husband, suddenly disappeared in 1906. Gunness claimed she had been sent to a finishing school in Los Angeles, but the girl was never seen alive again. In 1907, Gunness was seen with a man purchasing an expensive wedding ring in town; he soon disappeared. Later, she won the affections of Andrew Helgelein, a poor misguided fellow who withdrew all of the funds from his bank account before meeting a similar fate. However, Gunness was starting to run out of luck. All of her suitors had people who cared about them, and sooner or later they traced them to Gunness. Andrew Helgelein’s brother was particularly interested in his brother’s whereabouts, and wrote to Gunness to enquire after him; she replied that she hadn’t seen him before, but Asle Helgelein still decided to travel to La Porte to investigate. He arrived too late. On April 27, 1908, Gunness could be found writing up her last will and testament, claiming that she feared for her life because her ex-handy man, Ray Lamphere, was deeply in love with her and extremely jealous of her suitors. That same night, her house burned to the ground. Inside the house, four bodies were found: three children, presumed to be Lucy, Myrtle, and Phillip, and the decapitated body of a woman. Lamphere was arrested for murder and arson, but there was some speculation about whether or not the body of the woman was actually Gunness; without the head, the dentist couldn’t check dental records, and the shape of the body seemed too small to be Gunness. That’s when the whole morbid tale began to unfold. Items like watches were being found in the rubble of the Gunness house, and Asle Helgelein showed up alleging that Gunness was a “gold digger” who was murdering men and taking their money. The sheriff remained unconvinced, so Asle took it upon himself to ask Joe Maxson, the Gunness’ most recent handyman, if Gunness had a place where she dug holes for things like cinders. The answer was a place near the hog pen—which, incidentally, had an unusually high fence. Asle grabbed a shovel and started digging. He ended up finding his brother, the most recent of Gunness’ killings. His body had been chopped up and stowed in flour sacks. They found several more bodies, one of which was quite obviously Jennie, who hadn’t gone to California at all; the theory is that she got suspicious of the suitors leaving in the middle of the night and was going to raise the alarm. Around twelve bodies were found near the hog pen; it could have been more, but with so many body parts, it was difficult to tell. The digging continued, and more and more bodies were found in the fields. Most of the bodies were never identified, but reports flooded in from relatives of missing people who believed their loved ones had made their way to La Porte before meeting their untimely demise. Lamphere, who was found guilty of arson but not murder, later admitted to helping Gunness bury the bodies. He claimed that she had murdered 42 people all told. She would give her victims a nice meal and then drug their coffee; after, she would either smash their heads with a meat chopper. Other times, she would simply poison her victims. After dissecting them and chopping them into pieces, she buried them in the yard or fed their remains to her hogs. As for Gunness, a lot of evidence points to her escaping the fire that killed her children. Lamphere claimed he lured a woman to the house where she was killed and her head was chopped off. Gunness then drugged her children, killed them, and left them in the house to burn. She took off, never to be seen again. Whether or not Lamphere was to be believed, Gunness’ bank backed his story, saying that Gunness had withdrawn nearly all of her money the day before the fire. That, combined with creating a will shortly before her supposed death, made people suspect that she had intended to fake her own death and skip town. However, Gunness’ dentures were found in May of that year, convincing the dentist and some of the townsfolk that she had indeed died in the fire. That said, the skull wasn’t recovered. Many people remained convinced that she was still at large somewhere, living off the fortune she made from her victims. Her death was never confirmed and she was never tracked down. Numerous sightings were made around the Chicago area, but none of them were confirmed. Well, I think it’s safe to say she has been burning in Hell for quite a while now.